It's done - the airplane with a Sherman tank cannon in the nose. The Beast. At least that's what I call it. And it looks beastly too, with that gritty, oil-stained paint job and utilitarian markings. Update: the accuracy of those markings are no longer in question. It was as it is. Anyway, this is the airplane that took Wendell to the end of his tour. On April 4, 1944, he was on his way home, having flown 50 combat missions against the Japanese in Burma, China and Thailand. He left behind friends and colleagues, the smoking ruins of success and also the possibility of dying in combat. Now, I have to be frank. These guys have seen a lot of the terminal nature of life be it "back then" or now, as the last-men-standing of their wartime units. So, I ask the question, "Do you believe in some sort of fate that's kept you around so long?" Wendell's answer was typical. "Sure! How can you explain it otherwise?" He went on to describe how he knew the utter uselessness of worry. The only thing he could effect was his own piloting of his airplane. Flak, fighters, bomb-blast debris - he could no more control them than the weather. With that understanding, the fear and anxiety of "Will I make it?!" evaporated. He learned how to live in the moment of Now, in the cockpit, trusting his soul to God and his mind to the "Just fantastic!" training by the Air Corps. Of course, there were those that didn't have Wendell's ironic sense of peace. He recalls men who froze at the controls, stunned by what could happen. Of these guys, Wendell holds no judgement. Just a gratitude for an abiding faith in God that he developed as a kid. But he prefers to dwell on the positive. "I think, looking back, two thirds of (us) had a faith stronger than their fear." War is inevitable. To pull something positive out of it is an act of faith. 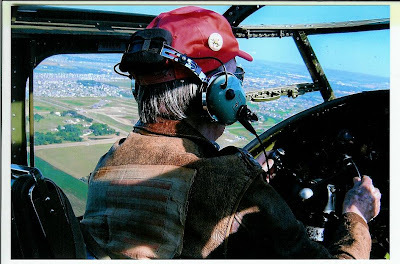 So is getting behind the stick of a B-25 at age 90. Yes, the photo below is Wendell. And yes, that's his original flight jacket. Who would have known? Note: The 22nd Bombardment Squadron also flew other models of the B-25 in combat. 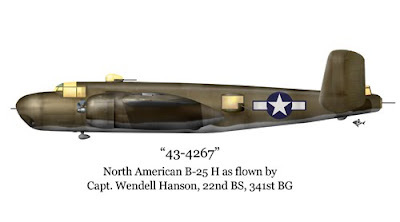 The majority of Wendell's missions were in the B-25C and D models. Progress note 1-20-10: I'm laying a scan of the first mask on top of the initial sketch - I was WAY too thick on the fuselage and according to my references (namely a website featuring a restored B-25H) the turret should have been moved forward. See the nose? That solid blunt shape is the H-sign and the sketched *flash! * is its signature - the bang of a 75mm cannon. The same kind found on Sherman tanks. Adding four .50 caliber "cheek" guns, four more .50's in the nose and the two .50s in the top turret equals 10 heavy machine guns to add to the maelstrom of metal. Not counting the rear and waist gunners! Talking to 43-4267's pilot the other day, I absent-mindedly remarked, "Wow. Seeing you low on the horizon had to scare the breakfast-lunch-and-dinner out of the Japanese." He looked at me as if I were making the understatement of the century. See - this thing didn't just attack targets. It turned them into dust. Regardless, Wendell's "H model" has my fascination right now. Partly because of its power, partly because of the little-known arena (Burma) and partly because I get to ponder the imponderables like "Why do people wage war?" and "Is it better to force surrender or to eliminate the enemy altogether?" Don't you love how History makes you think? Anyway, watch this space. This beast will take shape over the next few weeks and I'll be sharing a few interesting artifacts from her pilot's service. 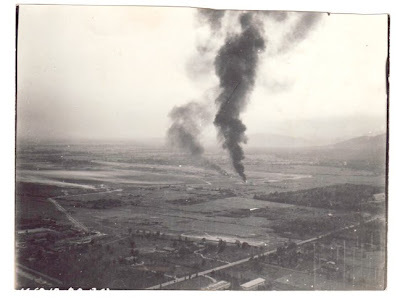 But in the meantime, the photo below was taken by 43-4267's tail gunner as they winged back to base, bleeding hydraulic fluid but leaving behind something for the enemy to think about. Oh. the photo was taken March 5, 1944. The war went on for 17 more months.